Chicago Reader: Aldrich is trying hard to say some deeply felt things about political morality, but the effect is less corrosive than his more generally pessimistic classic films noirs. Still, it's a gripping, angry film, well worth seeing despite its occasional lapses in subtlety. TimeOut London: But praise to Aldrich for his no-nonsense direction, which fashions the material into a fairly riveting computer hardware thriller. His handling of the countdown - 'It stopped at 8. Next time they go!' - is sufficiently convincing for one to think that the film and everything else might end prematurely. Aldrich turns in a neat, professional job, and even his use of split-screen is unusually uncluttered. 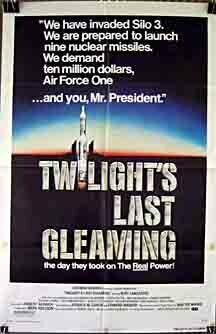 NYTimes: “Twilight’s Last Gleaming” epitomized a paranoid, quintessentially ’70s moment in American history and imagination. As a thriller, it is a nerve-racking procedural. Its parallel strands of action shatter into two, three and four split-screens that observe the silo, the White House and the special-assault squads outside the missile base. All of this is enhanced by a raft of old-guard stars: Lancaster, Richard Widmark, Joseph Cotten, Melvyn Douglas. The split screens were so jarring for me, but I forgive them because of all the other awesomeness packed into this movie. I loved Lancaster and Widmark as the ageing, Cold War-era military leaders since we're not too many years removed from seeing them headline great Cold War thrillers like Seven Days in May and The Bedford Incident. Isn't it a missile silo IN Montana?